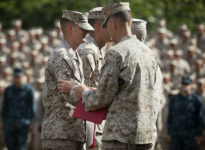 MOORESVILLE, N.C. — Ever since he was a boy, Garrett Carnes had every reason to want to be a Marine. The biggest reason was his father, John, who admittedly steered his son in the direction of military service. Garrett will need to reach back on that drive and a competitive spirit, fortified by years as a star high school athlete, to overcome his greatest battle yet. Garrett was badly hurt while serving in Afghanistan last weekend. Garrett’s mother, Rhonda, said getting the news was like a nightmare that has yet to end. “We thank God he’s alive and coming back to us, but it’s a lot to take,” Rhonda said. The news was also a devastating blow to Courtney Carnes, Garrett’s 21-year-old wife. Garrett’s wife and parents aren’t the only ones eagerly anticipating his return home on Friday. Neighbors and friends all over Mooresville have put ribbons on their doors and light posts. The Carnes’ family says it’s also been overwhelmed by support on Facebook from people all over the world. A Facebook page has been set up for Garrett Carnes. Click here to view it. MOORESVILLE, N.C. — Near the same field where he once played football, dozens gathered at Mooresville High School in honor of Cpl. Garrett Carnes. Carnes, a 22-year-old marine, was clearing homes at a village in Afghanistan in February when he stepped on a roadside bomb. “When we got the news – I can’t even tell you. It was very hard to take,” said Every. While he begins the difficult road to recovery at a military hospital in Maryland, hundreds of miles away, his hometown wanted to help. Saturday they held a walk and fundraiser for Carnes. “It’s just overwhelming to see how many people that don’t even know my family have come out and reached out to us,” said Garrett’s brother, Zach Carnes. Supporters signed banners and bought t-shirts for Carnes, raising about $15,000 to help the marine who graduated from Mooresville High in 2008. Perhaps most importantly, though, they walked – each step as a tribute to the wounded warrior who now must learn to walk again. “Garrett’s definitely a hero, and nothing holds him down,” said Zach. Carnes’ family says he is doing better. They’re hoping to have him return home to Mooresville in a few months. 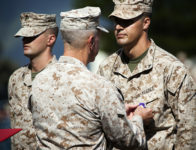 Mooresville, NC — There’s no place like home and coming back a hometown hero makes it even sweeter for one Marine in North Carolina. That’s what Marine Corporal Garrett Carnes came home to Friday in his hometown of Mooresville. Thousands of people crowded Main Street in the area near the Mack Citizens Center to greet the wounded Marine. Carnes, 22, is home for the weekend from his rehabilitation at the Walter Reed Army Hospital in Bethesda, Maryland, where he was presented with the Purple Heart by President Obama. Carnes was injured in an IED explosion in Afghanistan in February. That blast took parts of both of Carnes legs. Hundreds of motorcycle riders with the Patriot Guard escorted Carnes back to Mooresville from Maryland. Carnes was able to ride as well, riding with his father on his motorcycle. Carnes was presented with the key to the city and was able to have a reunion with his beloved dog, Titan. Carnes and his family are well known in Mooresville. Garrett played football for the Mooresville Blue Devils and graduated from MHS in 2008. Carnes will have about a year and half of rehab to learn to walk on prosthetic legs. Cpl. Matthew Gusty (L), India Company. Marine Corps Base Hawaii. August 2012. Lance Cpl. Zachery Fisher (R), India Company. Marine Corps Base Hawaii. August 2012.